This Week I Learned ☆ – How’s That Working For You? How often are you faced with a feeling of being uncomfortable with the statements of others? Like when someone tells you that you are being unfair, when you know in your own mind that you never intended to be anything but fair. You think that they read your intention wrongly and adamantly insist that they are wrong, despite what they present as overwhelming evidence. Throughout every society and culture, people live in denial without even knowing it. If your first thought is I am certainly speaking of someone other than you, you may actually be exhibiting the first of several "tells" of actually living in denial. "How many times have you started a sentence with, "I'm not...", "I can't...", I don't..."? You will note that those phrase begin with you and the second word is a negative. If you find yourself using these phrases you are most likely living in denial. Anyone and everyone is susceptible to denial, or the clinical term of abnegation, which means the act of renouncing or rejecting something. From the richest, most powerful persons in the world to the poorest of us, live in denial from time to time. What is important is that you understand those things in your life that others may find disconcerting about you and be able to make an intelligent decision as to whether the other person is acting on their own defense mechanism, suffering from an addiction of false fault finding, or if they are in actuality concerned about your well-being and offer genuine constructive criticism. On the surface, denial is simply asserting that a statement or allegation is untrue. Denial is only problematic when one rejects the reality of what is generally perceived as the truth. When this happens, and especially when the denial becomes an addition, the consequences can be dire. Yes, denial can become addicting. Denial is considered by contemporary psychoanalysts as a stage of the coping cycle. When an unwelcome event occurs, especially a traumatic event, the first impulse is often one of disbelief and thus begins the process of coping with the event. Obviously, there are at a minimum two manners of coping; acceptance or denial. In a healthy mind, coping with those things which are uncontrollable, can slowly rise to a greater consciousness, perhaps becoming a subconscious repression just below the overt awareness as the person accumulates the emotional resources to fully face the trauma. As the healthy mind faces the trauma in an acceptance manner it becomes enlightened and is better able to deal with the reality of the trauma. The coping mechanism begins to sufficiently deal with the trauma or represses it for the time being, and eventually is removed from the conscious awareness to the point that it may be completely forgotten. It is also possible that trauma can be repressed metaphorically to the point of neither quite forgetting nor quite remembering. In this instance, the trauma is allowed to re-emerge in the consciousness, such as in a protracted illness with an ongoing process. The process of sublimation or transference of coping from denial to acceptance involves a full resolution process and should never be confused with only one stage in the cycle. The theory of denial has been thoroughly researched and has significantly expanded in both scope and utility. It is universally classified as a mechanism of an immature mind, as it conflicts with the ability to learn from and cope with reality. However, denial can occur in the mature mind, most commonly when one is faced with impending death of either their own or a loved one. It often is the first of the five stages of a dying patient, or even the reaction of survivors to news of a death. 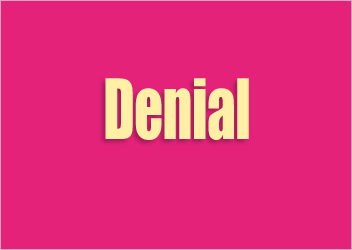 The general existence of denial makes it one of the most controversial defense mechanisms. And, like many forms of defense mechanisms it is commonly used to create unfalsifiable theories. Those that are in denial will say or do anything to disprove the existence or reality of an event. They may state that, yes, the evidence points in a negative manner towards them, but they reject the premise that they are in denial. Using the twelve-step programs used in addition counseling, where abandonment or reversal of denial forms the basis of at least five steps of most programs, i.e. the ability to deny or minimize the behavior of the addiction, we see the ineffectuality of the programs. This is, however, an essential part of what enables an addict to continue his or her behavior despite evidence that - to others - appears overwhelming. It has been proven that compulsion is seldom effective in treating the addiction, as the habit of denial remains. When a family intervention is conducted to help a person engaged in self-destructive behavior such as alcohol or drug abuse to accept help for his problem, denial is sometimes reduced or eliminated altogether. This is seldom necessary, however, for the intervention to be successful in having the person accept help. The most common denial response is to avoid the facts by attempting to deceive either oneself or the other person. Those who are in denial will often use lies to avoid facts they believe are painful to themselves. Deception is used by creating an outright falsehood, leaving out certain details through omission, or by falsely agreeing to something. Justifying: when someone makes a choice and attempts to make that choice look okay due to their perception of what is "right" in a situation. This often overlaps with Blaming as the denier will attempt to show that others are acting in a similar fashion, so it must be okay to act in that way. Denial of consequence involves a person's avoiding thinking about or understanding the harms of his or her behavior has caused to self or others, i.e. denial of the consequences. This enables that person to avoid feeling a sense of guilt and it can prevent him or her from developing remorse or empathy for others. Denial of impact reduces or eliminates a sense of pain or harm from poor decisions. Often the denier will attempt to minimize the immediate impact by making a feeble and false attempt at apology, only to continue the behavior. Many who use this type of denial will say things such as, "That's the way I have always done it" or "I don't know why I acted in that way." Denial of cycle is where a person avoids looking at their decisions leading up to an event or consider their pattern of decision making and how harmful behavior is repeated. The personal pain and harm being avoided by this type of denial is more of the effort needed to change the focus from a singular event to looking at preceding events. It can also serve as a way to blame or justify behavior as described under Denial of Responsibility. This form of denial attempts to divert pain by claiming that the level of awareness was inhibited by some mitigating variable. The denier will make statements "I suppose it's because of the way in which I was treated in the past." This is most typically seen in addiction situations where drug or alcohol abuse is a factor, though it also occasionally manifests itself in relation to mental health issues or the pharmaceutical substances used to treat mental health issues. This form of denial may also overlap with denial of responsibility. Harassment covers a wide range of offensive behavior. It is commonly understood as behavior intended to disturb or upset. In the legal sense, it is behaviour which is found threatening or disturbing. This may involve gaslighting and victim blaming. Gaslighting is a form of mental abuse in which false information is presented with the intent of making a victim doubt his or her own memory, perception and sanity. Instances may range simply from the denial by an abuser that previous abusive incidents ever occurred, up to the staging of bizarre events by the abuser with the intention of disorienting the victim. The term "gaslighting" comes from the play Gas Light and its film adaptations. The term is now also used in clinical and research literature. The actual abusers threaten, bully and make a nightmare for anyone who holds them accountable or asks them to change their abusive behavior. This attack, intended to chill and terrify, typically includes threats of law suits, overt and covert attacks on the whistle-blower's credibility, and so on. The attack will often take the form of focusing on ridiculing the person who attempts to hold the offender accountable. The offender rapidly creates the impression that the abuser is the wronged one, while the victim or concerned observer is the offender. Figure and ground are completely reversed. The offender is on the offense and the person attempting to hold the offender accountable is put on the defense. If you believe that failure is never an option, you may have a denial problem. As humans we are all flawed by nature to a propensity of both success and failure. You may have to fail several times, each time learning from your errors, before you actually become successful at anything you do in life. While it may sound disconcerting to accept failure, believing that you are too hard-working, knowledgeable, or talented to fail, and that everything you attempt will result in a successful outcome is a delusional way of thinking. You should always reflect on the possibilities, be ready for what ever happens, work hard to avoid failure, but you may have to accept what ever happens in the end, and learn from your failures so that you avoid repeating the same errors in the future. If you believe that you can somehow plan your life so well that surprises are an impossibility, you may be living in denial. While planning ahead is highly recommended, as in the above paragraph, you should understand that to think that you can actually be able to prepare for absolutely everything is just plain foolish on your part. If you are of the belief that the best way to have something done right is to do it yourself, you may be in denial. Deniers seldom believe that others can be trusted due to their own inner lack of trust in themselves. A person who is in denial need the support of others to help them overcome their issues, but are often unwilling to trust others and it may become a Catch 22 in which they end up doing nothing more than continue to travel in the same vicious cycle of denial. Most deniers will blame all of their misfortune on others. They are forever doing everything right and others spoil all of their good efforts. This comes from a lack of assuming responsibility for the consequences of their actions, which are the most obvious signs of living in denial. “I don't know where to begin...", "I can't do that because...." I'm not going to do this because…”. If you find yourself making excuses for everything, you are most likely in denial. Making excuses is simply another form of denial of responsibility and the consequences of your actions. If you think that everyone is wrong and you are the only one that is always right, you may be in denial. Is it really possible that everyone who disagrees with you are ignorant and you are actually that brilliant? Deniers have a huge problem with others as a general rule. It seems that others seldom understand their way of thinking or that other simply don't get it. Dr. Edward de Bono actually wrote a book entitled, "I'm Right - You are Wrong". In his book, Dr. de Bono, who is well-known worldwide for his origination of lateral thinking, puts forward a direct challenge to what he calls the 'rock logic' of Western thought. de Bono believes that this thinking can seldom solve our problems. Instead of rock logic, he proposes another perception. Drawing on our understanding of the brain as a self-organizing information system, Dr. de Bono shows that perception is the key to more constructive thinking and creativity. Does it often seem that others working against your best efforts? Are you the victim a huge conspiracy against you? It it time to realize that the rest of the world is seldom the problem and perhaps the problem is you. It’s time to stop living in denial and to see the reality. Often a denier will take an “oppositional conversational style” (OCS) in disagreeing with and correcting whatever another says. Maybe in a friendly way, maybe in a belligerent way, but their remarks are framed in opposition to whatever is said. Most people find it tiresome to be on the receiving end of OCS. Some deniers engage in OCS with others because they find it amusing to argue with others, or they want to make their argument clear in regards to their side. Most deniers fail to recognize the likely effects of OCS on others, and have no idea that they are annoying others. Hopefully, you can understand how everyone has a bit of denial in their life. By giving it a little thought you may find that you have too much denial in your life. If so, how's that working for you? It can be preventing you from living the life that you want, need and deserve. Learning to better cope with denial can be highly beneficial to you and to your future. Think about it!